Generate intrigue for your newest and hottest products or solutions with engaging made to order window graphics! If you are offering targeted services or products, you want to give privacy for your visitors inside your business, or just hope to inform your would-be customers about what you can provide for them, attractive window signs and vinyl graphics get your business and brand noticed and recalled. The Sign Authority is your reliable neighborhood vinyl window sign partner, crafting inviting window graphics, signs, decals, and displays that effectively builds your brand and business visibility. Call The Sign Authority today at (630) 597-1771 for your Free Consultation! The Sign Authority provides effective window signs, lettering, and graphics for enhanced brand awareness. 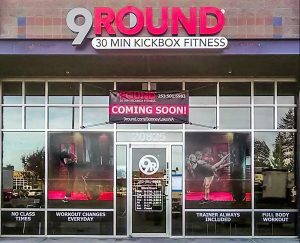 Our experienced vinyl sign professionals provide long-lasting window graphics that support your overall business goals, complement your existing branding efforts, and ultimately attract more new potential buyers. Our window signs and graphics specialists will deliver the perfect, branded signs and graphics your business needs. We ask questions about your brand and business to make smart suggestions for products that will best suit your business. Our experienced professionals are prepared to help support your business goals with eye-catching window graphics, wraps, lettering, banners, signs, and more. We all know retail shops have a lot invested in their front window displays. An attractive window display is specially designed to pull engaged possible purchasers inside your business. If you’re promoting a special sale, promotion, or event, or need to enhance sales connected to a new, high-ticket item, exciting window displays are an affordable way to do this. Traditionally, promotional window displays are revised with the seasons to emphasize the hottest, latest products you have to offer. 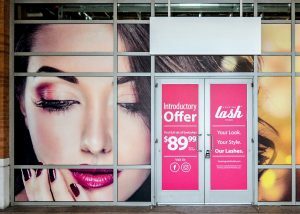 The Sign Authority provides engaging window signage products to publicize your specific events and sales and exciting items in an eye-catching way that can draw in more new shoppers. Office buildings, similar to counselors, real estate agents, law firms, insurance brokers, banks, service professionals, and many other business types and niches, implement high-quality vinyl window film on their front-facing windows for branding, promotion, or privacy functions. Our dedicated staff of professionals deliver privacy film that provides the same look and feel as a custom etched glass window pane, devoid of the high price and hassle of entire replacement glass panes. 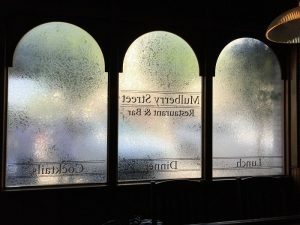 Quite a few professionals also decide to include the logo and branding elements, company name, and other custom images or messaging added as part of their etched/frosted privacy film for business promotion and brand identification. Our custom signage experts can craft specialized privacy film ideal for your company and clients, or give examples of commonly selected vinyl film alternatives that will reinforce your branding goals. You don’t need a retail business or sell physical products to improve business visibility with an eye-catching window display! Put your storefront to work for your company with custom graphics, lettering, banners, murals, and posters demonstrating your most beneficial solutions, special offerings, or even build an exciting custom window display that gets your business noticed and remembered. Our experienced custom sign and graphics consultants consider your specific business needs to generate the right branded display that you expect. We manage manufacturing as well as the installation of your custom branded window signs and graphics. 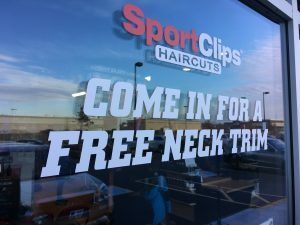 When you want an experienced window graphics company that will supply the high-impact, high-visibility window displays your business needs, The Sign Authority has the solutions for your business. Call The Sign Authority today at (630) 597-1771 for your Free Consultation with a Window Graphics Specialist! A JOY to deal with and the difference a LOCAL business makes!